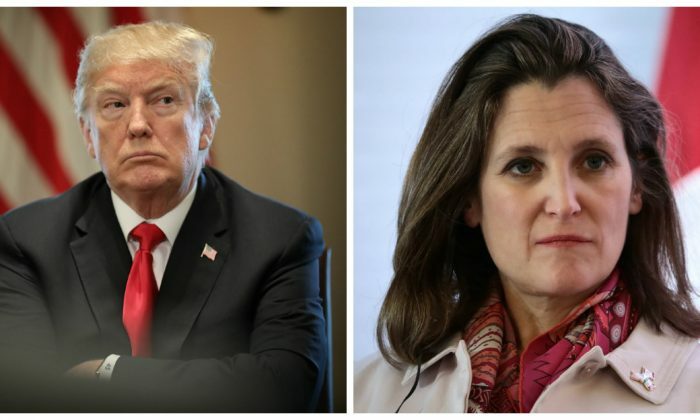 Canadian foreign affairs minister Chrystia Freeland responded yesterday to the White House’s announcement of a 25 percent tariff on steel and 10 percent tariff on aluminum. “As a key NORAD and NATO ally, and as the number one customer of American steel, Canada would view any trade restrictions on Canadian steel and aluminum as absolutely unacceptable,” Freeland said in a press release yesterday. “Any restrictions would harm workers, the industry and manufacturers on both sides of the border. The steel and aluminum industry is highly integrated and supports critical North American manufacturing supply chains. The Canadian government will continue to make this point directly with the American administration at all levels,” Freeland said. At a meeting at the White House yesterday with leaders of the steel industry, U.S. President Donald Trump decried the treatment of America’s steel industry due to bad trade deals and policy.